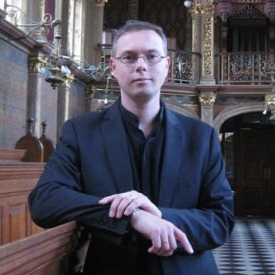 Rupert Gough leads a busy career as choral conductor, organ recitalist, teacher and reviewer. He has been Director of Choral Music and College Organist at Royal Holloway, University of London since 2005 and previously spent 11 years as Assistant Organist at Wells Cathedral. At Wells he worked closely with the choir both as accompanist and choir trainer, appearing with the choir in concerts and broadcasts all over the world, and can be heard on many different recording labels including six discs for Hyperion. His overall discography of some 40 commercial recordings encompasses work as a choir director, organist and harpsichordist and conductor and includes the organ and choral works of Sir Percy Buck (Priory) and instrumental and choral works of Carson Cooman (Naxos). Rupert is particularly renowned for his work in combination with the violin as a member of the Gough Duo. The Duo’s many American tours have taken them all over the USA from Florida to Alaska. During 2009 they performed to a capacity audience in the Svetlanov Hall in Moscow. Born in 1971, Rupert was a chorister at the Chapels Royal, St. James’s Palace, and won a scholarship to the Purcell School of Music. He received (with distinction) a Masters degree in English Church Music from the University of East Anglia whilst Organ Scholar at Norwich Cathedral. In 2001 he won Third Prize at the St. Alban’s International Organ Competition. He has performed widely and featured with many different orchestras including the Hong Kong Philharmonic Orchestra for the 2006 Hong Kong Festival. As a conductor he has worked with a variety of professional choirs and orchestras and as well as many distinguished soloists. At Royal Holloway he has been responsible for the development of a choir of choral scholars now regarded as one of the finest mixed-voice collegiate choirs in the country. The choir undertakes a busy schedule of concerts, tours and records for Hyperion Records.